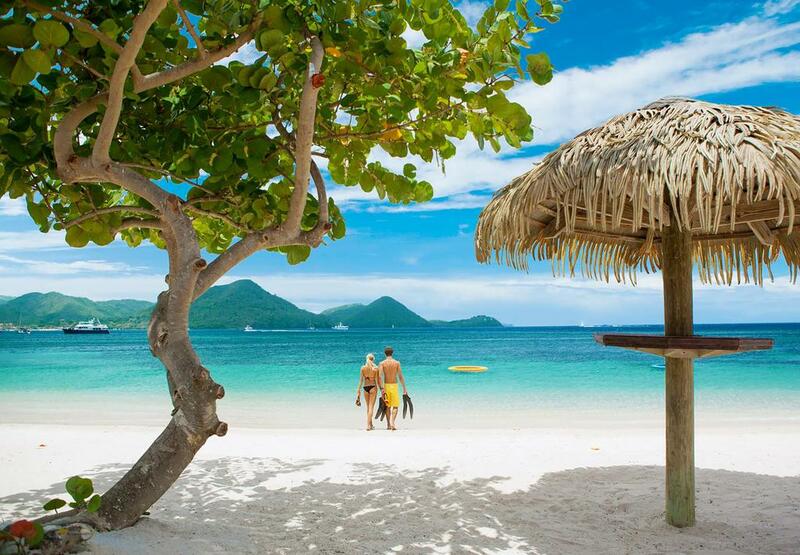 Nothing says paradise like St Lucia all inclusive resorts. 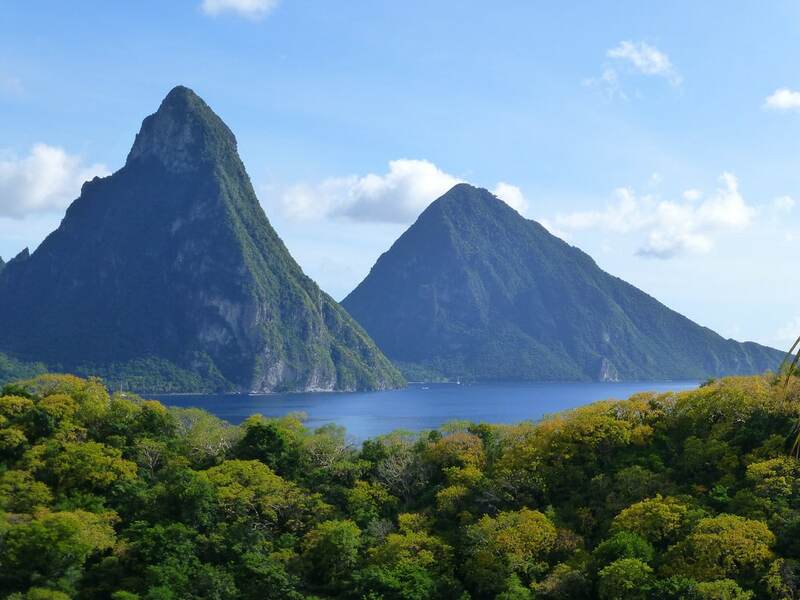 An eastern Caribbean island nation, St Lucia is known for its strikingly tapered mountains, volcanic beaches, luxury accommodations, and vibrant turquoise waters. There are so many reasons to choose it as your destination for romance, relaxation, and adventure. And if you can’t decide, our dreamy picks for St Lucia all inclusive resorts might help you narrow it down. Whether you’re coming for the epic snorkeling and dive sites, upscale experience of Soufriere, or to soak in an infinity pool above the rainforest, St Lucia has a lot to offer the sun-seeking traveler. For those of you seeking to stretch your dollar as far as possible, there are plenty of options on the island. And they’re all drool-worthy. We’ve narrowed it down to our absolute favorite spots. Now, it’s time for you to do the picking. Come and stay in St. Lucia’s most beloved boutique hotel. This luxury resort is tucked away on its own secluded sandy beach. Once a former sugar plantation, Cap Maison lets its breathtaking design and views speak for themselves. From exquisite rooms to fabulous suites with private pools and roof terraces, you can have it all here. 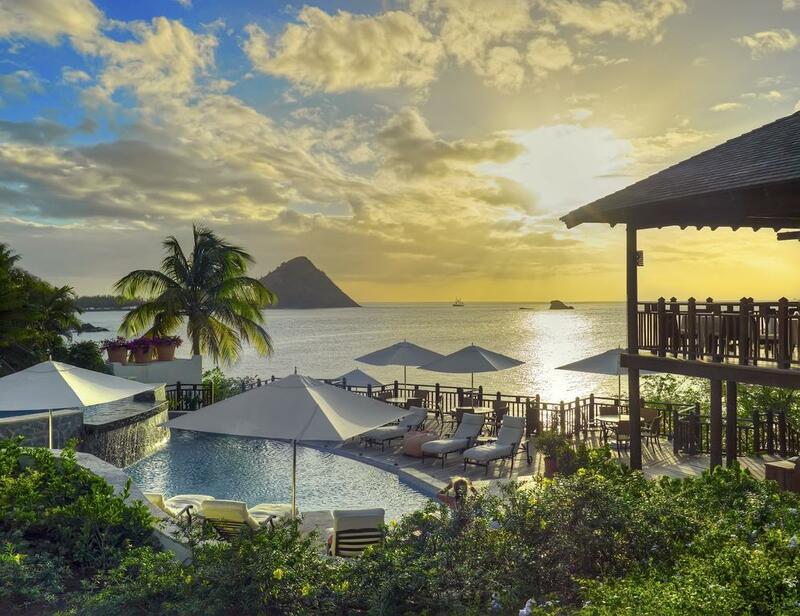 As one of the most dreamy St Lucia all inclusive resorts, you’ll experience a stay quite unlike any other. The “Cap It All” package includes breakfast, lunch, dinner, as well as wines, spirits, soda, and rum by the glass. If you’re looking for a little more privacy during your stay, we recommend booking their ocean villa with a private pool. Come discover your ideal vacation at Ladera Resort. One of Soufriere’s oldest and most famous cocoa plantations, this unique stay is the only resort located on a UNESCO World Heritage Site. If you’re looking for somewhere tropical and romantic, this is the place to go. Perched on a volcano ridgeline 1,000 feet above the Caribbean Sea, panoramic views greet you and stunning views of the Pitons stretch as far as your eyes can see. With just 37 rooms and suites, the resort’s intimate design makes it easy to connect with the local beauty. In light of their eco-friendly philosophy, each room incorporates natural elements from the island. Locally harvested tropical floor wood, stone, and smooth tile all add to a simple yet elegant ambiance. Even the furniture is made on-site by local artisans. An “open wall” at the back of your suite leads to a private plunge pool and breathtaking scenery. Whatever you need, attentive staff are there. From start to finish, every amenity is designed with your ultimate relaxation in mind. 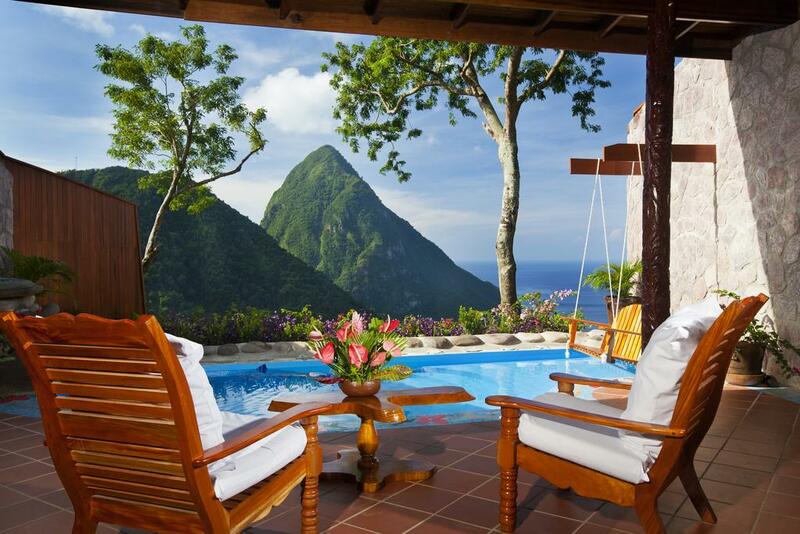 Ladera is one of the most dreamy St Lucia all inclusive resorts. We’ve all seen the commercials. There’s jaw-dropping white sand beaches, tantalizing clear blue water, and couples with an enviable tan. Well, now it’s your turn to have a dream vacation. As one of the best St Lucia all inclusive resorts, Sandals Grande St Lucia offers well, just about everything you could dream of. And the best part is there are no hidden fees. Located on its own private peninsula, this resort is often described as “the closest vacation to a picture perfect postcard.” To the west, you have the beautiful Rodney Bay, boasting the calmest waters around the island. Over to the east is the majestic Atlantic. This resort offers jaw-dropping views, luxurious amenities, and a fun way to explore it all. The price of your stay includes scuba diving, sailing, water skiing, on-site dining at over twelve different restaurants and eateries, unlimited premium drinks at swim-up bars, and a mile-long beach to soak up the sun. 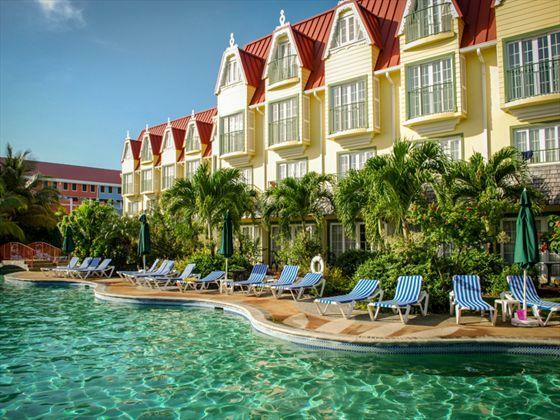 As a favorite location of the Sandals resorts, your stay starts at less than $300 a night. There’s no doubt that this is one of the best deals on the island. Just keep in mind that since travelers come here to take advantage of all the deals, it can get a little loud. If you’re seeking a quieter vacation, make sure to request a room far from the bars and main lobby well in advance of your stay. And let’s just say having one with a plunge pool certainly wouldn’t hurt either. 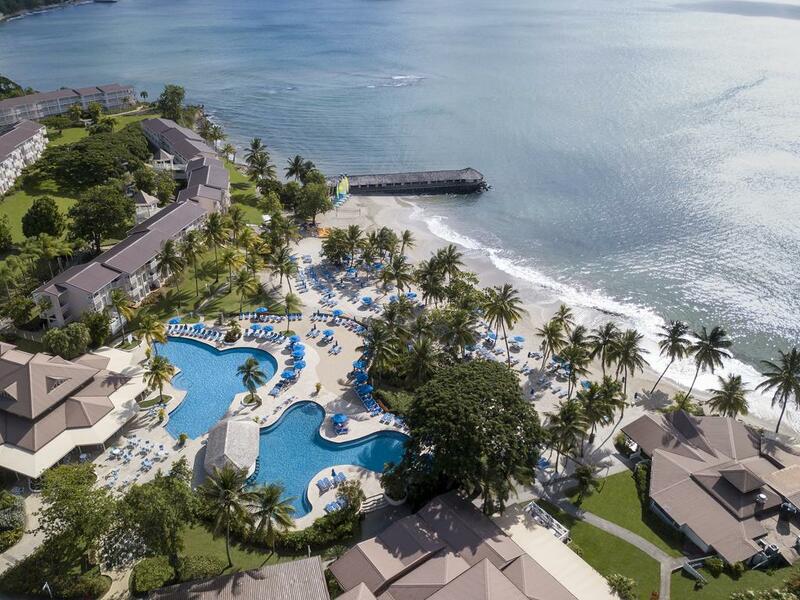 This has to be one of our favorite St Lucia all inclusive resorts. Leave your worries behind you on the beaches of the Caribbean coastline. Nestled into a cliffside, Jade Mountain Resort offers magical views of the surrounding landscape, perched 600 feet above the sand. Here, you are greeted by jaw-dropping views of the sea and all the region’s natural beauty. While many resorts seem to stand out from nature, Jade Mountain blends with it seamlessly. Architect and owner Nick Troubetzkoy did an exceptional job of creating it in harmony with not only the island’s feel but also its culture. Long bridges lead you to private, serene infinity pools and tall columns give walkways a spacious feel, reaching up to the sky. Inside your suite, you have plenty of space to lounge. With an open floor plan and absent fourth wall, you fall asleep to and wake up with the most stunning island views. Unobstructed views of the sparkling sea and towering mountains are just below. Sip cocktails from your own private infinity pool for the sunset. Stargaze from the resort’s lovely Celestial Terrace. And when you’re in the mood for some extra pampering, head over to the spa. Does this sound like your dream stay? As one of the best St Lucia all inclusive resorts, you’ll have everything you could dream of and more. Art galleries, boutiques, world-class restaurants, scuba diving, and a world of adventure await you. Honeymooners, welcome to paradise. Are you looking for something a little more budget friendly? When it comes to St Lucia all inclusive resorts, this is one of the most affordable alternatives. An 83-room hotel, Coco Palm offers the type of style and service you would expect at higher-end stays. Here, you’ll find a sizable free-form pool, chic French Caribbean decor, and cheerful rooms with terrace access. You even have the option to book with or without an all inclusive stay. While the hotel isn’t quite on the sand, you’re only a short walk away from Reduit Beach and a stone’s throw away from the comforts and charm of Rodney Bay Village. Experience the island at Bay Gardens. Located in St. Lucia’s stunning Rodney Bay, this resort incorporates four unique hotels that exude the region’s genuine hospitality. Here, you have everything you need for a truly memorable stay. Whether you’re traveling for a destination wedding, looking for honeymoon spots, or vacationing with family and friends. 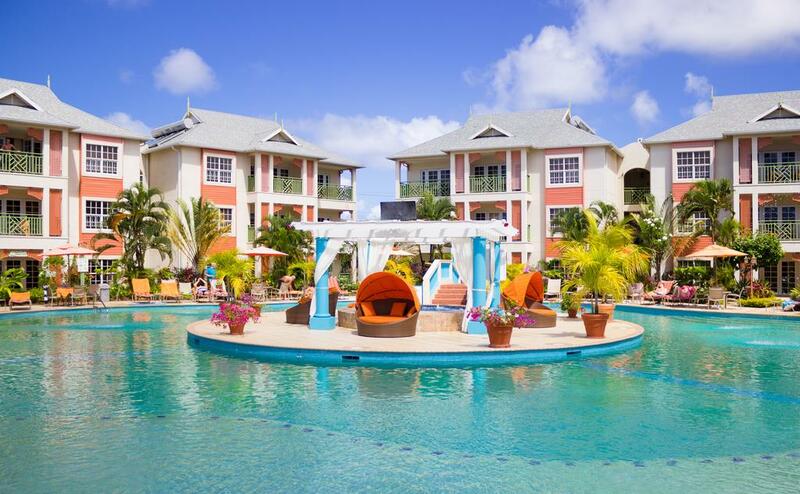 As one of the best St Lucia all inclusive resorts, Bay Gardens is renowned for its impeccable service, lovely amenities including on-site dining options, and inviting accommodations. We love this modern beachfront stay for its vibrant social scene. From your suites, you’re close enough to hear the rolling of the tide, even with the ac running to keep your room cool and breezy. During the evening, make your way over to HiTide Restaurant for some live entertainment. A world of comfort and luxury await you at St. James’s Club at Morgan Bay. Spread across 22 acres, this lively resort is a hot spot for singles, couples, and families alike. Full of amenities and activities, you will never run short on things to do. With four pools, six on-site restaurants and bars, and an incredible collection of activities, the options are entirely yours. Are you looking to spend a day basking on the beach? Or are you looking to be a little more creative and seek out some adventure? Either way, they’ve got you covered. With everything from tennis, to island tours, and Hobie-Cat sailing, you’re free to create your dream vacation experience. 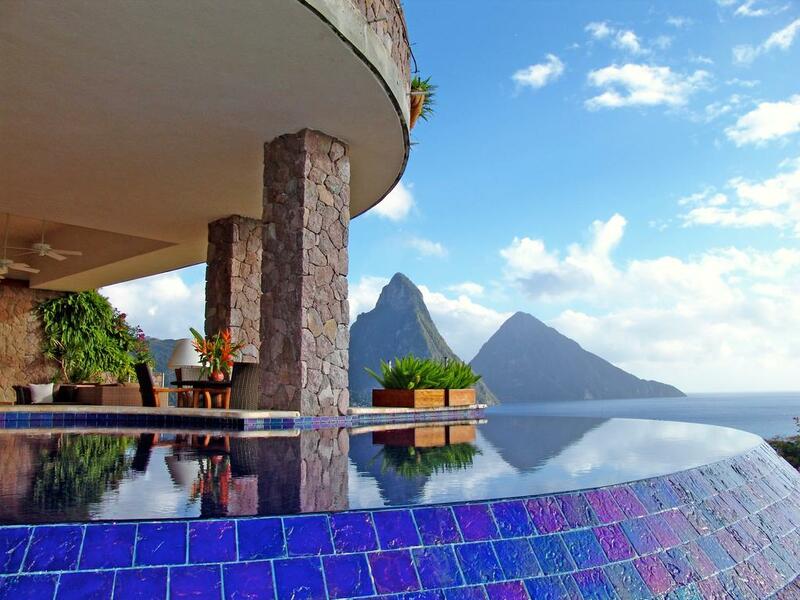 We hope you enjoyed reading our article on the best St Lucia all inclusive resorts. As you can see, this vibrant city offers so many opportunities for those seeking a trip of both relaxation and adventure. These hotels are right in the middle of it all, offering not only a unique place to experience the local wonders but also a home away from home. As you can see, St Lucia is teeming with beauty, adventure, and plenty of places waiting to be explored. Our choices for the top accommodations offer the best of both worlds - both rest and time for exploration. Whatever type of vacation you are seeking, you will find it here. From adult-oriented resorts all about romance to family fun options, we've helped you narrow down your choices to only the highest caliber places of accommodation. Do you have a favorite choice hotel on our list? Let us know which one it is in the comment section below.